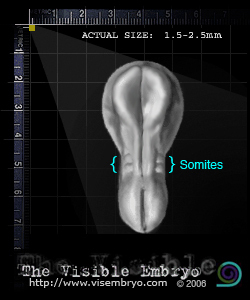 Looking at the embryo from the top, the head end is wider than the tail end, with a slightly narrowed middle. Somites, which are composed of mesoderm, appear on either side of the neural groove. The first pair of somites appear at the tail and progress to the middle. One to three pairs of somites are present by Stage 9. Every ridge, bump and recess now indicates cellular differentiation. A head fold rises on either side of the primitive streak. The primitive streak now runs between one-fourth to one-third of the length of the embryo. Secondary blood vessels now appear in the chorion/placenta. Hematopoietic cells appear on the yolk sac simultaneously with endothelial cells which will go on to form blood vessels for the newly emerging blood cells. Endocardial (muscle) cells begin to fuse and form into the early embryo's two heart tubes.